Bad Day For Unions Made Worse By Calif. Public Pension Initiatives : It's All Politics Wisconsin Gov. Scott Walker's victory Tuesday wasn't the only defeat for organized labor. Adding to the day being a memorably rotten one for unions were voter initiatives in two of California's largest cities, San Diego and San Jose, aimed at reducing the burden of public employees' pensions on taxpayers. 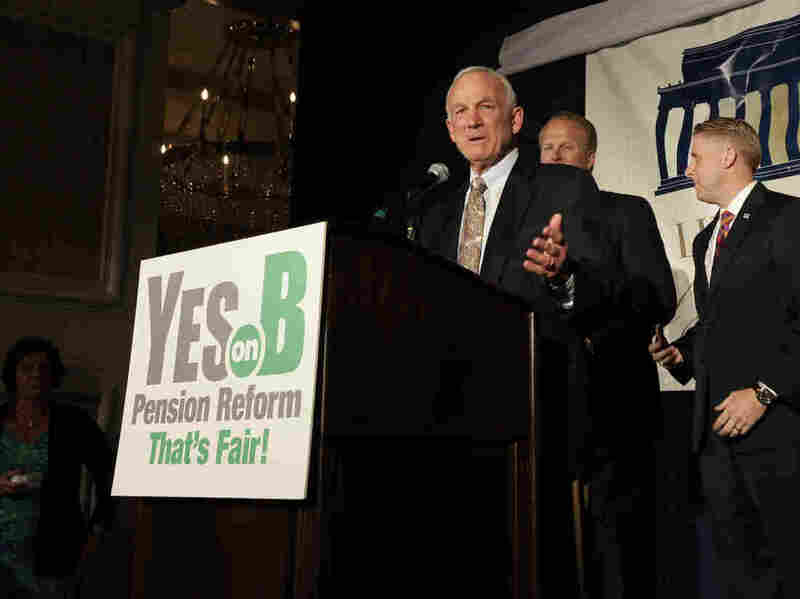 San Diego Mayor Jerry Sanders at a rally for supporters of Proposition B Tuesday, June 5, 2012. Tuesday was, unquestionably, a very bad day for public-employee unions and not just for the reason that got most of the attention, Wisconsin Gov. Scott Walker's success in fending off an attempt to oust him through a recall election. Making it an even more memorably rotten day for organized labor were voter initiatives in two of California's largest cities, San Diego and San Jose, aimed at reducing the burden of public employees' pensions on taxpayers. Organized labor opposed the changes in both San Diego and San Jose, with police in the latter city filing a law suit in state court Wednesday to overturn the initiative. The budget woes, partly fueled by rising pension costs, has led the cities to reduce services popular with citizens, like policing and libraries, and to cut their workforces. That helps explain why the initiatives to reform the pension systems in both cities won approval from nearly 70 percent of voters in the initiatives that were widely watched as cities around the nation struggle with similar problems. "Some municipalities are in trouble because of the design of their pension plans. Like other governments in the country, they've overcommitted themselves and they have not made their regular payments into the plan. But they've also got a structural financial problem that states don't face which is the limited nature of their tax base. Even in a large city you don't have the variety of economic activity that the fundamental economic resources of a whole state has. "So even a large city like San Diego can get into that kind of difficulty, let alone a small city like Central Falls in Rhode Island. That's the problem many cities have to wrestle with." Under the pension reform plan approved by San Diego voters, called Proposition B, new city employees would be enrolled in a 401(k), defined-contribution plan familiar to most private sector workers instead of the defined-contribution benefit plan received by prior city workers. Joan Raymond, a San Diego sanitation truck driver and president of American Federation of State, County and Municipal Employees (AFSCME) Local 127, said in an interview that the city doesn't have a pension crisis but a political crisis. She places much of the responsibility for the proposition one of its major proponents, Republican City Councilman Carl DeMaio who has said publicly that he wants to make San Diego the "Wisconsin of the West." "It's called pension envy. But it's misguided. Because we believe all workers should have retirement security. Not extraordinary but reasonable. We would like to bring the bar up. Why do you want to push people down? That is not a sound way to make your community stronger. "I understand why people feel that way. It's a natural human thing to be envious of someone who has more than you have. But that's not what we're saying. We want everybody to be able to retire with a sense of security. "Because in the end, the taxpayers are going to wind up paying anyway. If you aren't able to pay your rent or go to the doctor or feed your family, in the end, you're going to wind up on public assistance. And so society is going to pay one way or another. This is a more positive way." San Jose voters approved Measure B which, among other changes, requires current government employees to pay as much as 16 percent more of their pay to retain their current benefit level. The actions in those two California cities follows San Francisco voter approval of a pension reform plan last year. Unlike the changes approved Tuesday, those in San Francisco resulted from a compromise that included city officials and labor leaders. Whether the voter initiative process will be taken up to rein in rising public pension costs in other cities is unclear. Initiatives that can lead to new laws are available to voters in a minority of states, 21 to be exact. Meanwhile, some cities are in states that have consolidated municipal public pension plans with the states.